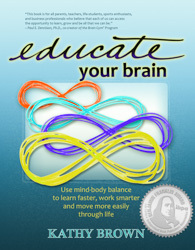 Kathy Brown has written many articles offering easy-to-understand descriptions of various Brain Gym® techniques woven into stories and case studies from her practice. Over the years, she has written both Articles and Blog postings, and this page is provided as an index of them all. Blog postings are more recent. Some of them update pieces previously written as newsletter Articles. Her Blog can be found by clicking here. Articles were written originally for Kathy’s newsletter, which she retired in 2013 when she began her Blog. Many of these pieces are now part of Kathy’s award-winning book, Educate Your Brain, which she wrote to share the basics of the Brain Gym® program. With this one book, you’ll be ready to begin your own practice of Brain Gym movements, or bring them into your classroom or therapy space. Balancing for Reading Success — Why some children resist reading (it’s visually disorienting) and what to do about it. Henry and Reading – Revisited — The story of the first time a child arrived at my office not able to read at all, and left reading fluently. I was simply stunned. Updated from a previous Article. “Thank You for Teaching Me.” — How understanding the challenge of “left-eye lead,” and then balancing for whole-brain integration, transformed one teen girl’s experience of reading. Ready for Reading — Is your child left-eyed, and did he skip the crawling stage? That could be behind his reading challenges! Brain Gym and Writing — Follow the story of young Asher, who went from total “meltdowns” when asked to write, to fluid writing, following one Dennison Laterality Repatterning (DLR). Brain Gym® – For a “Brand New Brain” — After a single Brain Gym session about gaining access to both her native Spanish and the English she’s learning, Amanda went from failing third grade, to easily doing her homework, and thriving the following year! Brain Gym Improves Reading — A year-long study in Ventura, CA shows results which are impressive both statistically and academically. A summary of research by Brain Gym consultant Cecilia Freeman. Brain Gym and Reading — Three Success Stories — Brain Gym sessions can make remarkable improvements in reading skills. Eye Teaming with Brain Gym — The cooperative use of both eyes, tracking and focus improve naturally with Brain Gym movement and balances. Reprinted from the Brain Gym Journal. Learning as a Force of Nature — The tale of a child who deeply “absorbed” the Lazy 8s pattern, and how it transformed her reading ability. Backing Up to Move Forward into Lazy 8s — What do you do when a child struggles with the Lazy 8s pattern? Back up, and experience it with the whole body, by walking it. NEW ~ Exploring Lazy 8s — This article was previously titled Refining Lazy 8s: Meeting the Learner’s Needs — Here’s important new information about how to get the most out of one of most frequently used Brain Gym movements. NEW ~ The “Brain Buttons” – Acupressure points for releasing stress — This article is a modification of pages 17-20 of Educate Your Brain, for publication in the May, 2017 issue of Green Living Arizona. “But It’s So Simple” — A participant in a group session for those with Traumatic Brain Injury (TBI) experiences how simple movements can lead to profound change. Priming the Brain with Movement: The Power of PACE in a Special Ed Classroom — The story amazing outcomes achieved with children with diverse “diagnostic labels” after just a few simple Brain Gym movements. PACE and Eleven Sentences — A quick sharing from an enthusiastic teacher who began using PACE with her students following a workshop. The Potential for Transformation: The Edu-K “Balance” Process – A description of the Brain Gym session process, using the example of a client who desperately needed to pass a certain exam, but had great resistance to studying the material. Overcoming Phobias – with Brain Gym — The Brain Gym “balance” process can help to release the triggers causing seemingly “unreasonable” challenges. The Mental Game of Sports: Revisiting a Client Story — That tiny voice in Lloyd’s head was telling him he’d better not win his final matches — until he released that “mental block” through Brain Gym balancing. Just for the Joy of It — Not all Brain Gym balancing is to resolve challenges. Here’s what I did, simply to gain more pleasure from my daily walk! Balancing for Group Goals: The Power of Coherence – The “balance” process can produce stunning results for individuals looking for targeted change. Did you know this works just as well for groups, teams, and families? Brain Gym®: Potential for Changes Over Time – This article explores just how and why individuals can experience such dynamic change through the Brain Gym “balance” process. A Brain Gym Residency Day – Report on a day of facilitating Brain Gym balances with children with special academic needs, at a school dedicated to the Brain Gym® program. Brain Gym® for Traumatic Brain Injury — An incredible increase in ability for one participant in a group Brain Gym session for those with TBI. Brain Plasticity – Supporting Recovery from Brain Injury — The concept of “brain plasticity” may account for the dramatic changes seen after Brain Gym balancing, to help regain skills lost as a result of brain tumor surgery. Arm Activation – A Fall-Prevention Tool for Senior Citizens — A single Brain Gym movement transformed my elderly mother’s posture in moments, leaving her able to stand and walk in a much more stable, and safe, way. Understanding Retained Infant Reflexes — An overview of the infant reflex continuum, several key reflexes, why they may not “integrate” in a timely way, and what happens when they don’t. Steering Clear for Bicycle Safety – A cautionary tale of ATNR in action — When Asymmetrical Tonic Neck Reflex is retained beyond the infant stage, it leads to all kinds of coordination issues. NEW ~ Spinal Galant Reflex and its Effects on Bedwetting and Irritable Bowel Syndrome — The Spinal Galant Reflex causes strain in the low back region. Often, when this reflex is resolved, people are surprised to experience improvement in such things as irritable bowl syndrome and even bed-wetting. NEW ~ Resolving Moro ~ the “Startle” Reflex — The Moro Reflex often leaves us poised on the edge of “flight or fight.” Part Three of our exploration of Retained Reflexes. The Best Start Possible — The importance of an infant experiencing the world horizontally – on her tummy, or on her back. The Best Start Possible – a very sad addendum, and reader comments — The tragedy of “positional asphyxia”: why so many infants die when left in infant car seats. Teeter Totter Blues — Why does physical movement matter so much for children? One reason is development of the body-balance mechanism (the vestibular system) and its key role in reading. Integrated Low Gear: The Missing Piece in Learning — We can learn something new only when we slow down! How we can use Brain Gym® to easily switch back and forth between quick, fluid processing and slower, conscious exploration. Introducing Touch for Health — The Brain Gym program has historical “roots” in this simple system designed for use in the home to promote basic wellness through acupressure techniques. Refining the Fine Art of Noticing – Nothing changes until we’ve noticed how it’s working now. How do people to learn to notice their own state, and pick up on the state of others – especially infants? NEW ~ Does Brain Gym “make you tired”? Actually, no! – After using the Brain Gym movements, some people find themselves feeling inexplicably tired. Or – are they finally noticing the fatigue they’ve been in the habit of ignoring or overriding?